In a major revelation that could change all the political equations, Cobrapost-CNN IBN joint investigation team said that it found Narendra Modi's girlfriend in Greece. 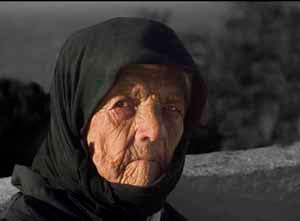 The investigating agency said that one 110 years old Amaryllis Dukas lives in Greece's capital Athens alone confirmed that she was Modi's girlfriend and his heart companion. According to the agency, Modi's girlfriend lives in a very bad condition, eats only one bread and peanut butter and lost all her tooth. "Is Modi a human being or animal? This is really a shameful act. He straight away left Amaryllis Dukas in bad conditions just to fulfill his dream for becoming Prime Minister of India. That's ridiculous to any human being in the world," said CNN IBN's Sagarika Ghose. According to Cobrapost, Amaryllis Dukas who has just celebrated her 110th birthday in the last week knows Modi since her childhood and loved with her heart. The agency said that Modi however, was not very keen on to maintaining the relationship due to his political ambitions. He was not even present at her birth day ceremony as he was busy attending some rallies. Ajay Saxena of Cobrapost who successfully handled the investigation said "We asked Amaryllis that whether she was Narendra Modi's girlfriend. She said yes. She told us she was very upset when she came to know that Narendra Modi, her childhood boy friend was busy in political rallies and blatantly told her that he would not come for her birthday. That kind of roughness would not be good for PM's candidate." Congress Party said that it would take advantage of the revelation and would raise issue in front of human, particularly women rights commission. "We knew that he was insane Hitler and never care about his companions. If he can't fulfill a small commitment to his girlfriend how can he commit the nation," said Congress General Secretary Digvijaya Singh. 0 comments for "Narendra Modi’s girlfriend found in Greece - Cobrapost"